The purpose of this design is to display the beauty and elegance of Garamond. 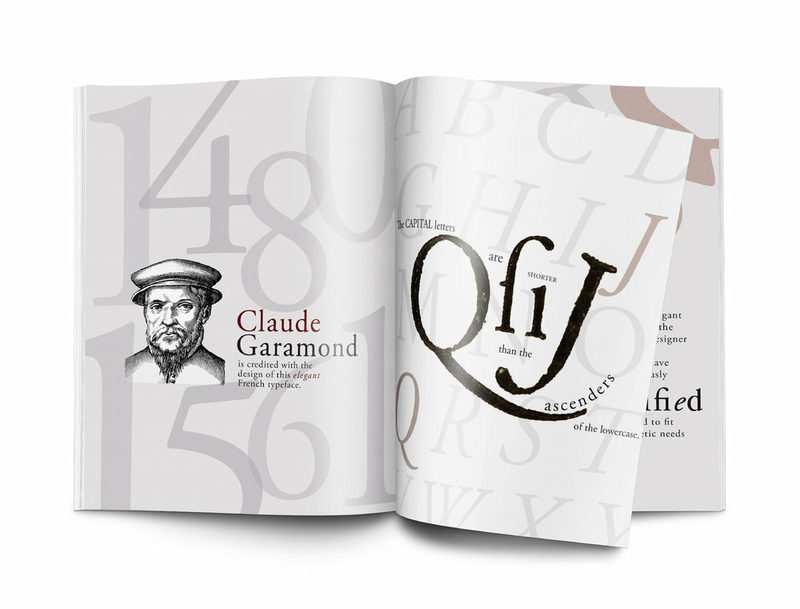 This booklet is a guide that brings the reader through the elegant letterforms and exciting punctuations of Garamond via the font style, font type, opacity, and color which all help increase the visualization of this classic type. 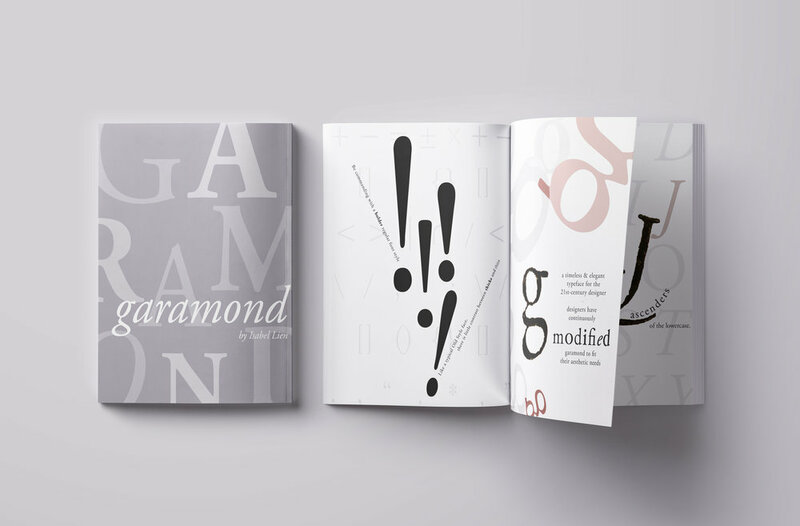 I wanted to display the beauty and elegance of Garamond through a small design booklet. This front cover shows enlarged letters in the background with a different opacity set for each. I contrasted that with the title/my name in an off-white, italicized form. That allows it to stand out, and it balances well with the background. You'll start to see a large font motif throughout this project. I realized the booklet needed another color added to the palette, so I chose a dark, rich wine color. It goes with the elegance. To the right of Mr. Garamond's page, I introduce the Garamond letterform. I wanted the text/images to interact and for the text to clearly translate what I was trying to convey to the audience. 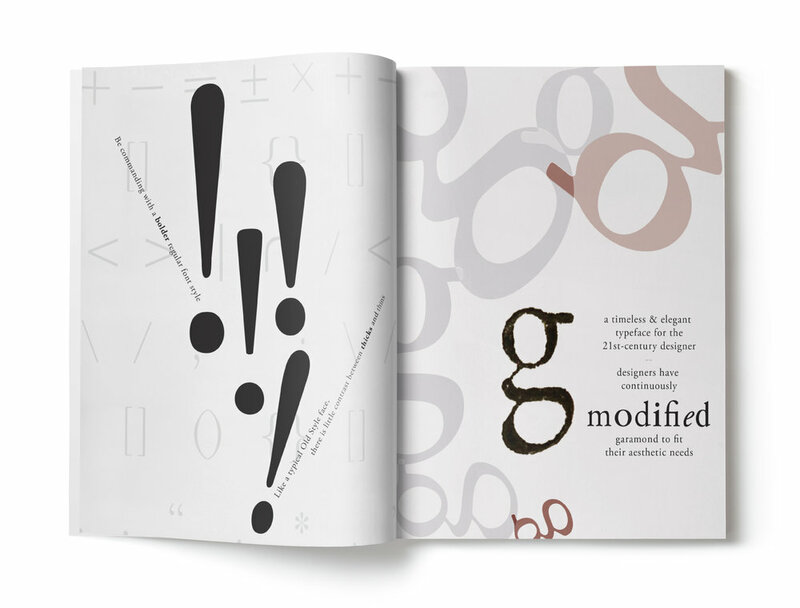 The large, dark and rustic letters were photoshopped to help the reader visualize Garamond's era. After the letterforms, boom, there are exclamation points (my choice of punctuation to highlight, in this case)!! The reason why I decided to accent these exclamation points (shown in regular, Adobe Garamond, Apple Garamond, and italic), is because it's unexpected. Garamond is pretty and elegant-those adjectives aren't exactly used to describe such punctuation. The text reflect the vibe of exclamation points as well, featuring more fun punctuation in the background. My background choice, this time, is using variations of Garamond-from Apple Garamond to ITC Garamond. The purpose of adding opacity is to bring out some differences in the loops and ears. 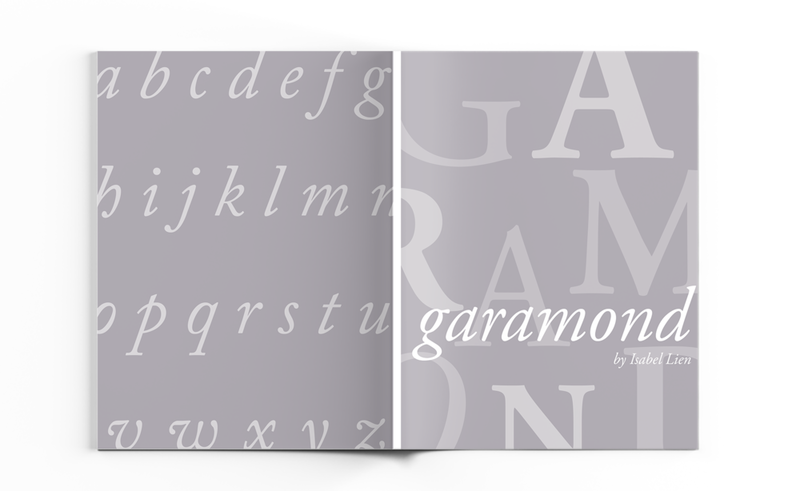 The italicized, lowercased letters bring together the Garamond booklet. It's simple, yet effective.